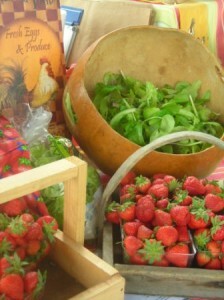 Strawberries, strawberries, strawberries at the market on Saturday! Along with the berries there will be… Swiss chard, spinach, and kale. Broccoli for the first time this year, green onions and beautiful radishes. We will also have a variety of lettuce… Italian blend, Red Sails, Simpson Elite and Grand Rapids. Kenny has been cutting mint and cilantro so we will bring some of that too. We will have some fresh herbs … basil, dill, parsley, cilantro, oregano, thyme, sage, a few tarragon and rosemary. Kenny will be bringing some Heirloom tomato plants, several varieties of peppers and some egg plants.